naked eye, you do not need binoculars. Azm= Azimuth - The direction to the satelite, with relation to TRUE NORTH. Compass north is about 8 degrees to the west! Elev= Elevation - The angle upwards from the horizon. 0° is the horizon , 90° is straight up overhead. ALL SPACE STATION PASSES ARE WEST TO EAST, VIA SOUTH. Basically, this means that it will always rise above the horizon in the approximate direction of where the sun sets at night, and on a full overhead pass, will set in the direction where the sun rises in the morning. It will traverse from West to East, via south, but will never quite get directly overhead. The Elev. figure gives the height above the horizon at any one time. 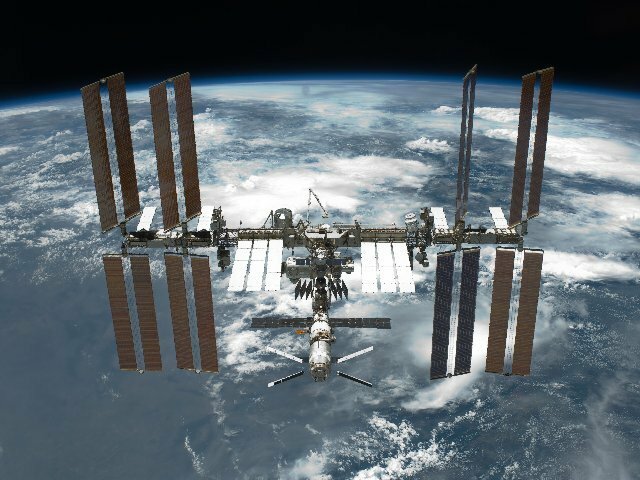 As the Space Station only reflects sunlight, on most passes, it will only become visible when above 10° elevation, and on some passes it will "fade out" before it reaches the East Horizon.